This entire transformation business just got really serious!! 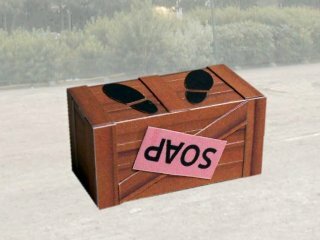 By now, most readers and subscribers of my blog know that I often write with a bit of 'tongue in cheek', diverting sometimes to stand on a virtual soapbox if the need arises. Today, I stand not on a soapbox, rather I stand to testify to the incredible life-changing episode that I'm currently experiencing... Friday night, I finished my treatments at Urban Homme, and much to the delight (and maybe even pride) that I saw on UH's Jacky (my personal body sculptor), I was literally almost moved to tears upon standing up and looking down to see what I thought must have been someone else's stomach. Then after looking into the mirror, I became an instant believer in the magic that the team at Urban Homme can weave!! I don't even know how to portray this feeling in words... it's sort of like trying to capture Niagara Falls in a photograph - a picture just cannot possibly do it justice. My tummy was not only much smaller, it was a completely different shape. Without ado, let me try and "briefly" expand on the leadup to the event on Friday night and Saturday lunchtime. At 6pm, I made my way from one of the most hectic days I've had in the office all year for my appointment at the Cocoon. I already knew what treatments I was heading in for, and they all revolved around abdominal trimming and sculpting. It was great to see Emeric also, my good friend and fellow Icon challenger. As usual, the moment I arrived, I was treated to some wonderful tea and a 'Dead Sea Salt' foot spa. 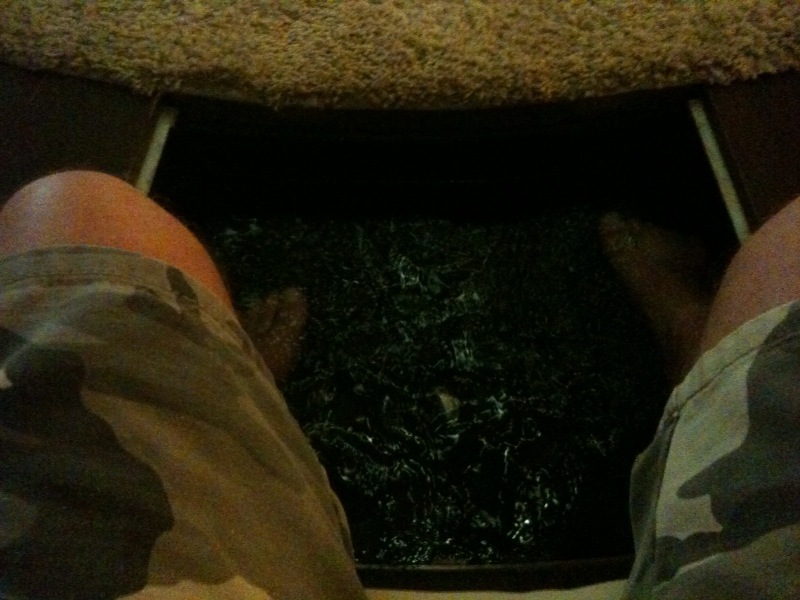 Given the busy week, I can tell you that there is nothing much closer to heaven than the feeling of soaking one's footsies and subsequently having a 'massage tap' on the bottom of the feet. In terms of stress, it's like going from '100 to 1' in a matter of minutes. Let me pause for a moment and just gladly point out, dear readers, that even before Friday night's treatment, most of the bulging tummy has already disappeared from previous treatments, working out and dieting - checkout the following picture in my LPG suit - can you see the top line already clearly visible? The next line is also appearing - one more and it will be very close to a six-pack - something I haven't seen outside of a bar since my early-twenties!! Following on from this, I underwent my third session of LPG (to soften the fat cells in preparation for the 'pièce de résistance' and most premium of all of the Urban Homme treatments, the Advanced Wave Frequency). 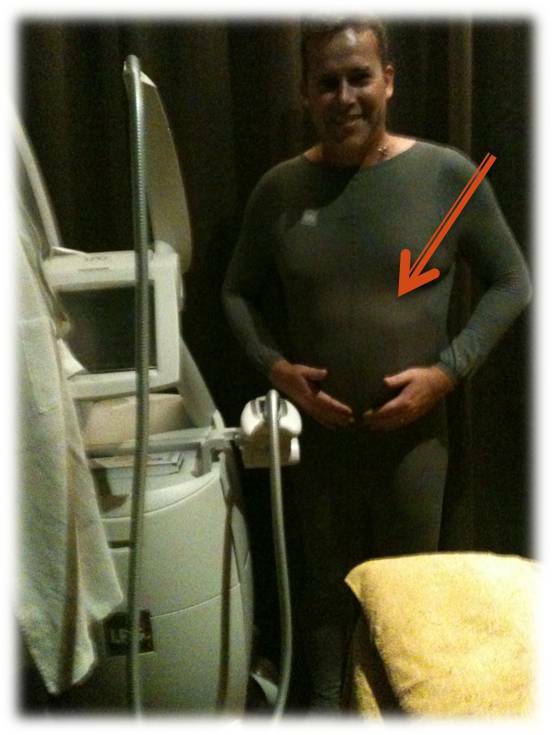 This was when I was completely blown away - Vince explained that I should expect at least 0.5 to 1 inch to come off the tummy circumference from the Advanced Wave Frequency treatment - little did I expect the complete reshape of my abdomen that occurred. As I mentioned before, after feeling so disheartened with myself for gaining so much weight these past four years, the results of the AWF actually moved me quite emotionally! I couldn't wait to get home and lift my shirt to show Sammi (who was equally as shocked). The WF treatment actually works by sending radio frequency waves deep into the dermal and subcutaneous tissues of the abdomen to dissolve fat cells - this happens by causing them to heat up and burn... it also leaves you feeling very, very hungry!! So here I was today... just a matter of hours before the roadshow was due to begin, and I was at my 'second home' again, the Cocoon at Ngee Ann City. This time, the focus is on my skin. Again I met up with another challenger and great mate, Daniel. I've come to enjoy these sessions immensely - I never thought that having someone working on improving my face could actually be so fantastic and be so relaxing. Mind you, given that I now fall asleep during what feels like the most amazing face massage one could ever experience, I'm nervous to think about what my personal skin consultant thinks of me - I don't know how much I'm snoring (I know it's at least a little, because it wakes me from time to time) or even worse *aghast*, perhaps I'm dribbling!! These treatments are making my skin so clean and soft, that even my 3yo son Jaime used one of my own expressions on me when I arrived home - while reaching up to touch my face, he uttered "Daddy, that feels as soft as a baby's bum"! WTH??!! Later that afternoon and after arriving home, I packed up the family to make the trek to Jurong Point - this was in fact a special moment, being the first trip out (except to the paediatrican) for 1-month old Casey... and boy, was I showing him off!! This turned out to be great fun indeed. Catching up with nearly all the guys (Daniel, Emeric, Benson and Dennis) and being made to feel a little like a celebrity in front of the large volumes of weekend shoppers. As soon as we located centre stage, we noticed the huge picture board with our faces and 'love heart' voting spaces... quite surreal, actually. Once it was our turn in front of the crowd, we were interviewed one by one, by a couple of well known radio (and my wife tells me, also TV) personalities. As I've already mentioned, it's always a great feeling these days to talk about the 'then and now' in terms of my body and weight loss - 9kg and gaining rapidly on the target!! CLICK HERE TO VOTE NOW AND RECEIVE THE FREEBIES! !